Uhm… Have I heard this name somewhere already? I think… actually i might! 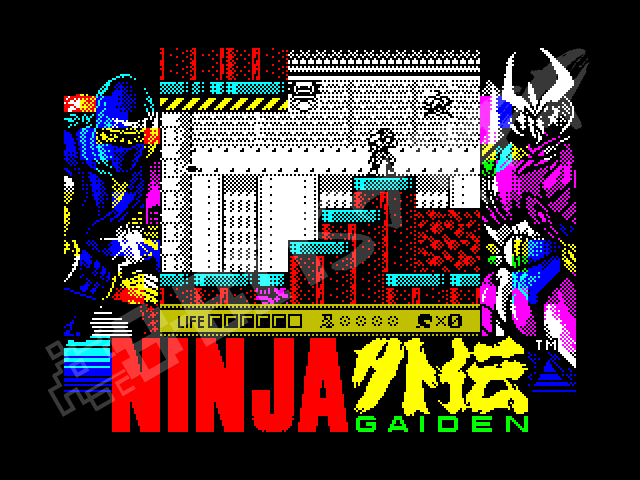 Ninja Gaiden, that’s the name of a Japanese blockbuster with errm.. a ninja. The Japanese word Gaiden (外伝) means Side Story by the way. This game was originally released in 1988 by Tecmo and has been ported to a wide range of computer platforms and consoles. However, the ZX Spectrum wasn’t in the list. But that changed this month! 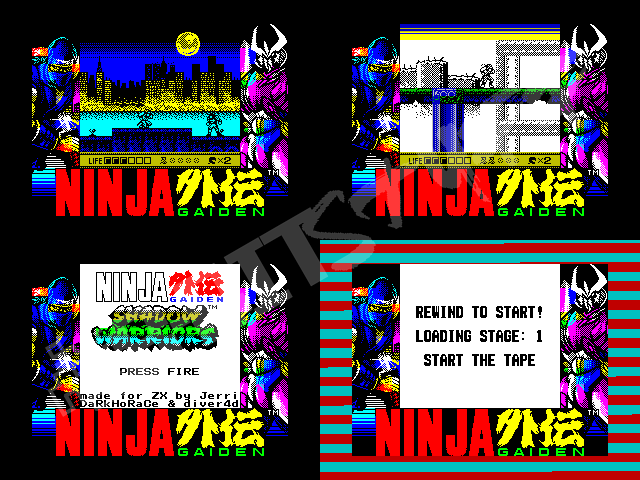 A bunch of indie developers – Jerri, DaRkHoRaCe and diver4d – took the Game Boy version – which is the 1991 Ninja Gaiden Shadow actually – and adapted it to the Spectrum. Wikipedia says about the game’s plot following stuff: Set three years before the events of the first Ninja Gaiden (NES), the player controls Ryu Hayabusa, who must save New York City from the forces of Emperor Garuda, a servant of Jaquio. Garuda’s minions include the cyborg “Spider”, kickboxer Gregory and his manager Jack, former military commander Colonel Allen, and the Japanese nobleman Whokisai (風鬼斎 Fūkisai). Hmm, sounds good. But what about the game? Well, the converted result is kinda cool. Let’s look at it. Nice loading screen swearing a good gaming experience. The graphics by diver4d are cute. Because of the fact, that the programmer took the same resolution from the Game Boy version, the whole game runs in a window in the middle of the Speccy’s screen and the rest are illustrations with these nice and cute graphics. The graphics in the game window, which is the only moving area on the screen, are a bit basic and monochrome, though. It is strongly visible that it’s converted and modified, but this fact doesn’t make the game any worse. There’s in-game music, also. It’s very retro, as it seems it’s just a conversion as well. The Spectrum can do better things, but this one was ment to be authentic. So no hardware envelopes and advanced drums. Just the plain melody with a couple of white noise rhythms. The second round’s getting harder with the annoying birds. The gameplay is surprisingly well. I used the standard QAOP-Space key combination with no problems. The ninja has to go to the right direction, kill all the enemies and reach the end of the level. Besides of that, there are special loot boxes with extras like energy pills, lives and weapons. Because the ninja is armed just with a sword at the start. Anyway, he can walk, can use the weapon against enemies but can also climb on walls and hold the poles when it’s necessary. Levels are often divided into more parts with different graphics. At the end of each one there’s a final boss. This is pretty standard in this type of games I guess, but there’s one more cool stuff: The game uses a level multiload, just like in the good old times. Remember? That could be frustrating for someone wanting to play the game from the tape, but hey, it’s kinda cool to see a new game using this old fashioned system. So whenever you play the game on, you can always turn the fastloading off in your emulator and enjoy loading each level separately, waiting, and rewinding the tape and loading the first level again when you make it to die. 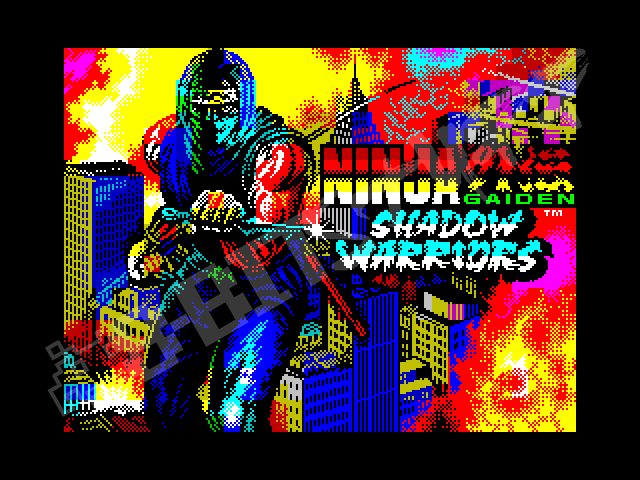 The Ninja Gaiden – Shadow Warriors is a very nice piece of stuff. But the main thing is, that it is playable. No need to worry about slow loading of levels, as we have things like divIDE/divMMC or emulators in the 21th century. Go get it from the Internet and try it, it’s free and good New Stuff!